Pastor Who "Laid Hands" On Trump: The CIA Trains ISIS At 49 US Bases And Ships Them Around The World - Joe.My.God. “The dogs want war. Our American men and women are being used as cannon fodder for the globalist agenda. We’re not in Afghanistan because we’re killing terrorists. The ISIS bases are in 49 states in America that the CIA brings them and trains them here and then ships them out to the areas of the world where they want there to be conflict. They are all trained here. Osama bin Laden worked for the CIA, so does Anderson Cooper. 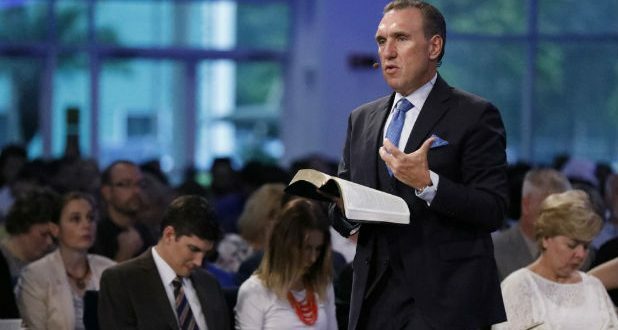 Work that one out.” – Pastor Rodney Howard-Browne, who was among the scamvangelicals to “lay hands” upon Trump in the Oval Office. PREVIOUSLY ON JMG: Last month Howard-Browne declared that Hollywood is filled with Satanic cannibals who drink the blood of children.